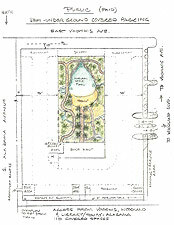 Michael E. Arth, Designer of the project and president of Pedestrian Villages, Inc. a home and urban design and development company located in Deland. 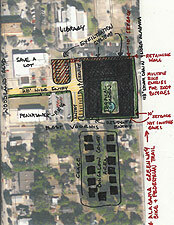 Pedestrian Villages, Inc. is in the process of developing an additional four acres of land in downtown DeLand’s Historic Garden District. This will complement Michael E. Arth’s earlier renovation of 30 homes and businesses in the same neighborhood. Phase II and Phase III of the Garden District Redevelopment will consist of The Palm Garden Cottages and The Palm Garden, which have been approved as a Planned Development by the City of DeLand. 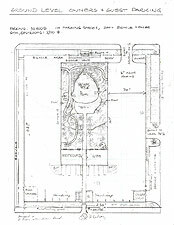 The Palm Garden is proposed to have the main public entrance at 235 South Woodland Blvd with the main residential entry on East Voorhis. This pedestrian-oriented commercial and residential development, on 2.52 acres, will surround a tropical oasis and spring-like pool with waterfalls. 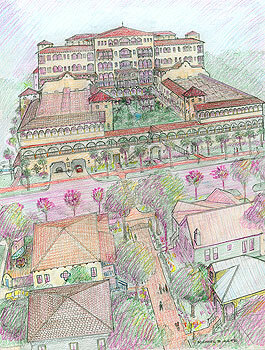 The Spanish Colonial Revival style main complex will be reminiscent of some of the grand resort hotels built in DeLand and San Augustine over a century ago. The site will host a tropical botanic garden, 52 residences and 27 businesses lining a covered promenade with sidewalk cafés and restaurants. A bike, Segway, and electric scooter shop will be located on the public parking level. Solar panels on the roof will heat the pool. There are to be two levels of semi-underground parking, parking for at least 200 bicycles, one level of retail, and four levels of residences. “City officials…showed support for the project in general terms, saying that it supported the city’s hope to build more residential units downtown. It was late 2000 when Michael E. Arth first proposed building a café-restaurant complex with a natural-style swimming pool set in a botanical garden. 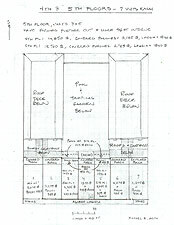 At the time he was also negotiating the purchase of most of the buildings in the neighborhood immediately to the east. 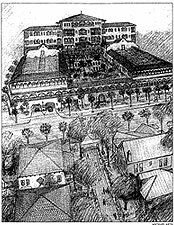 The watering hole was to have been called “DeLand Springs.” The current configuration came about in 2005 as a way to incorporate the earlier ideas but also to further energize the revival of downtown DeLand and the Garden District, and to provide much sought after downtown housing. 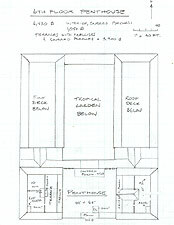 Arth realized that it was possible to create an outdoor tropical garden because the design and orientation of the building, combined with the sunken location of the garden and heated water features, will create a micro-climate that will protect the plants and trees from freezes. Coconut palms, ferns, cycads, and other tropical plants will be growing outdoors in downtown DeLand. 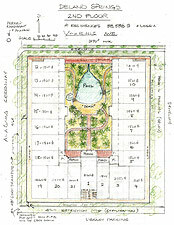 The natural style pools will resemble natural springs with waterfalls spilling over coquina rock cliffs. 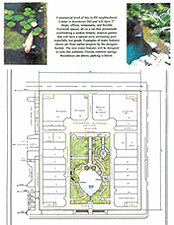 The pool and a spa will be reserved for the use of residents, shop-owners and their guests, but the multi-level botanical garden will be accessible to the public from a loggia that covers the promenade and from a lush jungle trail that winds up through the garden from the public parking level. 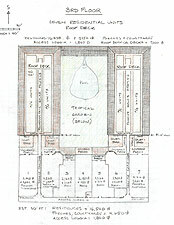 There will be viewing pool with waterfalls accessible to the public. 1. Downtown residents that will provide a lively, full-time presence. 2. A car-free promenade with a dynamic see-and-be-seen-scene. We see examples of this during the festivals and events where downtown streets are closed to cars. 3. Lacking a waterfront, we need an alluring water feature and garden surrounded by a diverse mixed-use neighborhood that will lift the spirit and draw more people to the center of town. 4. The completion of the Alabama Greenway, which will provide a linear park, bike and pedestrian corridor through town that will help reduce automobile dependency and encourage alternative travel and recreation. 5. Finishing the restoration of the Athens Theatre at the terminating vista of West Indiana. 6. Changing the name of Indiana Avenue to Main Street and permanently closing West Indiana to motor vehicles. Adding more shops with homes in the parking lot next to the old courthouse and encourage street performers, vendors, and a farmer’s market. More downtown parking can be hidden behind these new buildings in a multi-level structure. 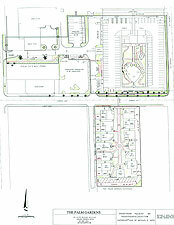 The new Main Street will spring to life and it will help the merchants of Woodland Boulevard and the rest of downtown. A typical beachside condo takes something away from its environment. It visually degrades its surroundings, creates more traffic in an area already blighted by automobiles and paving, and it blocks the natural processes that shape the coastline. The Palm Garden and other Pedestrian Villages will give something to community at the same time as enhancing the quality of life for the residents and retailers who will live and work there. The Palm Garden will provide a cohesive and vital neighborhood in an old-fashioned, historic downtown, and still allow easy access to pristine beaches and other area attractions within a short walk, bike, or drive. The proposed multi-use trail next to the project will connect to countywide bike trails. Palm Garden residents will overlook a protected and verdant tropical oasis surrounded with cafes, restaurants and interesting shops. DeLand has a enviable combination of climate, location, history, and potential both as a place to live and for a place to nurture the New Pedestrianism. With 900 people moving to Florida every day it is very important to protect our natural resources while creating new places that people will care about, and which will endure.